Steinunn Thórarinsdóttir (b. 1955), who lives and works in Reykjavík, Iceland, received her training as a sculptor at the University of Portsmouth in England and the Accademia di Belle Arti, Bologna. Steinunn has exhibited widely in Europe, Japan, North America and Australia. She has received numerous commissions in Iceland and abroad for both indoor and outdoor site-specific works. Steinunn has received many awards through her career, among them is the Order of the Falcon in 2009 from the President of Iceland for her contribution to international and Icelandic visual art. 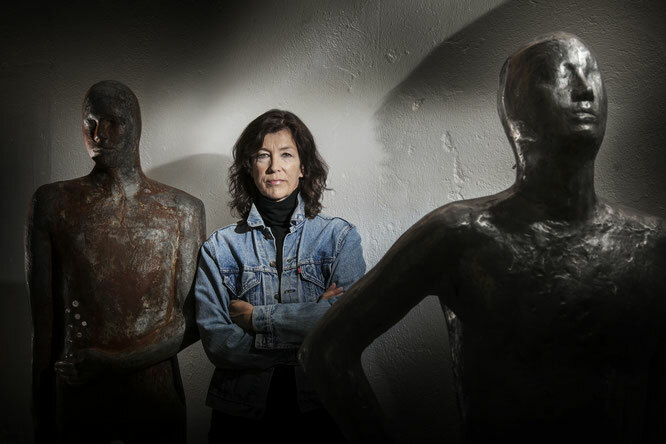 Steinunn has been working on figurative sculpture from the beginning of her career 40 years ago. Her sculptures are symbols of humanity. They are organic and explosive in their texture and formation thus firmly rooted in their Icelandic origin. Made of f.e. cast iron, bronze, aluminum, steel, and/or glass, they are often life-sized anonymous and androgynous bodies. Her works engage and confront the viewer in a direct and physical way but also encourage private discourse and interaction. Despite their seeming anonymity the works are based on her son´s body bringing in an element of family. The works are visually austere and stark but manifesting a sense of psychological interiority, Steinunn’s sculptures are archetypal representations of the modesty and frailty within the human condition.